Brushing and flossing one’s teeth on a regular basis is not all that is necessary for a comprehensive clean. Plaque and tartar will accumulate on teeth that are cared for on a daily basis. It begs the question: when should a deep cleaning be performed? Here is a look at the proper frequency of deep cleanings. How Many Deep Cleanings Should one get each year? The frequency of deep cleanings differs by each individual patient. Those who are at high risk for oral health problems should have deep cleaning performed at least once or twice per year. Those who are considered “low risk” patients will only require one deep cleaning each year. The bottom line is that it is crucial to customize oral health care to the patient’s needs. The patient needs to consult with us about the proper frequency of deep cleanings for his or her unique mouth. The patient will eventually settle on a number that is appropriate for his or her oral health needs. 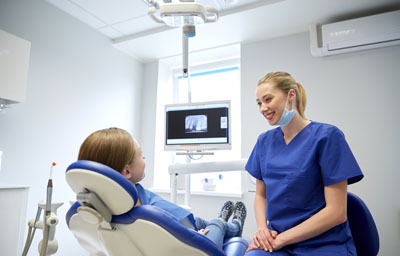 Visit the dentist and the dental hygienist will measure the space around the teeth with a probe. We do this to find out if there are any signs of pocketing. Pocketing is the space between the gum and the teeth where bacteria forms. The gum tissue depth between gums and teeth are referred to as pockets if they have a size of 5 millimeters or greater. According to the American Academy of Periodontology, adults should receive a periodontal evaluation each year to gauge if additional treatment is necessary. Healthy pockets measure about three millimeters in depth. If the pockets exceed five millimeters, a deep scaling might be necessary along with an appointment for root planning. If a patient has bone loss or gum pockets deeper than four millimeters, a deep cleaning is the best approach. If necessary, we can take X-rays to determine if such bone loss is present. A mouth exam will accurately measure gum pocket depth. It is possible to limit the deep cleaning treatment to the affected portion of the mouth or even specific teeth. Part of the need for deep cleaning stems from poor dental hygiene on the patient’s behalf. Patients should floss and brush once, if not twice or even more frequently every single day. It will also help to avoid sugar-laden foods and tobacco. If you eat sugary foods, be sure to floss and brush your teeth as soon as possible to reduce the potential for subsequent decay. If you need any sort of dental care, we can help. Whether it is a deep cleaning, a filling or any other dental procedure, our team of trained professionals is at your service. Contact us today to schedule an appointment. We can help ensure that your oral health is the best it can be and that it stays that way.